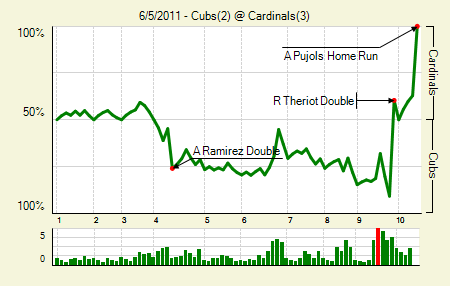 Moving the Needle: Ryan Theriot ties the game in the ninth with a double, +.512 WPA. 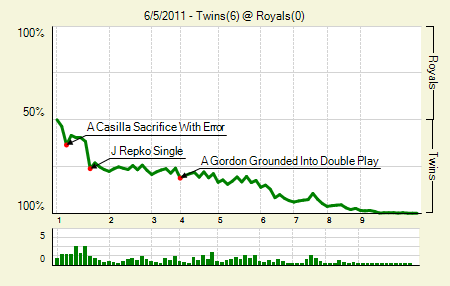 Damn WPA and its favoring of dramatic, game-tying moments in the later innings. If it weren’t for Teriot tying the game, though, there wouldn’t have been a chance for Albert Pujols to hit his second walk-off homer in two days. But let’s for a second step back and praise Theriot, who extended the game by an inning with his double. Really, even if you’re a Cards fan you have to appreciate that, if for nothing other than the feel-goodness of the walk-off. Albert Pujols: 2 for 4, 1 HR, 1 BB. For the series he went 6 for 11 with a double and four homers. Back? Chris Carpenter: 9 IP, 7 H, 2 R, 2 BB, 6 K. He was just setting ’em up for Pujols, anyway. Maicer Izturis: 2 for 4, 1 2B. He drove in and scored a run. Brett Gardner: 2 for 4, 1 2B, 1 CS. He’s now just 10 for 17 in stolen base attempts this year. 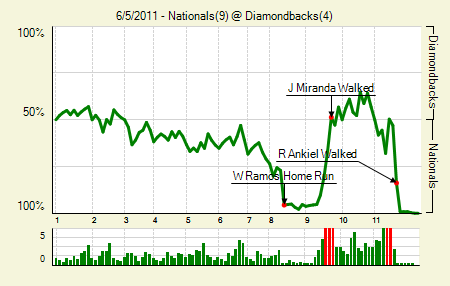 Moving the Needle: Rick Ankiel draws a bases-loaded, five-pitch walk, +.308 WPA. The Nats didn’t jump out to a big lead until Wilson Ramos’s three-run homer in the eighth, but it felt as though they should have had the game well at hand by that point. 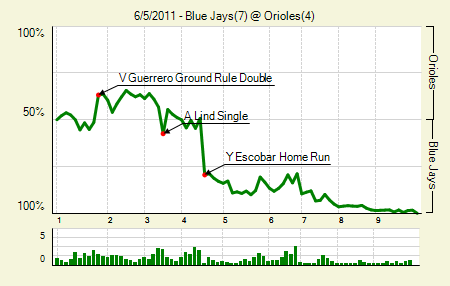 Twice they ended innings with the bases loaded, and they had plenty of opportunities otherwise. But the Diamondbacks rallied back with some bases loaded magic of their own in the bottom of the ninth, nipping a trio of Nats relievers for the three tying runs. In the 11th it was again bases loaded, this ime for the Nats with two outs. Joe Paterson, who had just walked Jayson Werth to load the bases, then issued a five-pitch walk to Ankiel, giving the Nats the lead. Mike Morse then sealed the victory with a grand slam. Ian Kennedy: 7 IP, 5 H, 1 R, 3 BB, 3 K.
Roger Bernadina: 3 for 6. They were all singles, but he was the only National to score more than one run. Moving the Needle: Yunel Escober smacks a three-run homer, +.302 WPA. Four baseballs left Camden Yards on Sunday, but none was more important than Escobar’s tie-breaking three-run shot in the fifth. That was enough for Jo-Jo Reyes, who picked up his second straight victory. I’d love to see him go on some kind of record winning streak now, just so we can see the media coverage of it. Adam Lind: 4 for 4, 2 HR. They were both tack-on solo shots following Escobar’s. That’s a nice way to get back into the groove after missing nearly a month. Edwin Encarnacion: 3 for 4, 2 2B. Since Dave said dump him he’s 7 for 17 with two doubles, a homer, and two walks. Moving the Needle: Rod Barajas’s bases-loaded double puts the Dodgers up by three, +.167 WPA. This was an old fashioned shoot-out for the first two and a half innings. The Dodgers held onto a 4-3 lead heading into the third, when they helped the cause with a three-run inning. Baraja’s two-out double was the big strike. Yet he wasn’t the star on offense. Chad Billingsley: 2 for 2, 1 2B, 1 HR, 1 BB. He drove in a run in each of his PA, including a bases-loaded walk. That makes up for his rather blah pitching line. Matt Kemp: 2 for 3, 1 HR, 3 BB. In his last five he’s 9 for 19 with four homers and five walks. 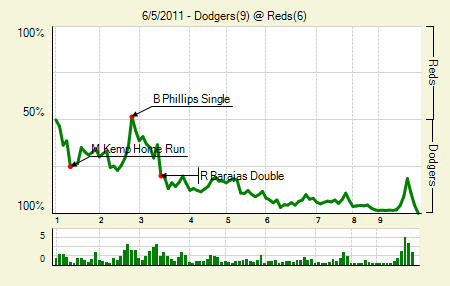 Moving the Needle: Carl Crawford’s three-run homer opens up an early lead, +.168 WPA. After two tight games to open the weekend, the Sox took control in the finale. A pair of singles to start the second set up Crawford, who hit one into the bullpen in right. The A’s did mount a comeback, but the Sox kept tacking on and eventually walked away with the sweep. David Ortiz: 3 for 4, 1 2B. In his last six games he’s 12 for 22 with four doubles and two homers. Jarrod Saltalamacchia: 3 for 4, 1 3B. That triple gave him the cycle for the series. 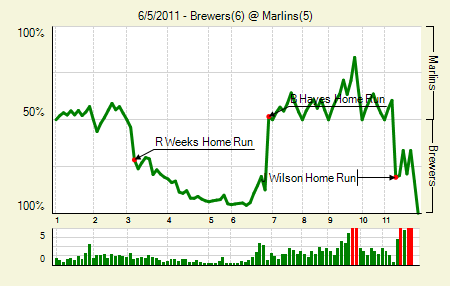 Moving the Needle: Josh Wilson’s big blast gives the Brewers the lead in extras, +.412 WPA. In 920 career PA before this year Wilson hit seven home runs. This year, in just 18 PA, he has hit two, including his homer over the tall wall in left yesterday. The homer put the Brewers up 6-5 in the 11th. They wouldn’t have gotten that far, of course, if the Marlins didn’t explode for five runs in the sixth, which included a Brett Hayes grand slam. Rickie Weeks: 2 for 5, 1 HR. He also scored on a balk. Gaby Sanchez: 2 for 6, 1 2B. He started the rally in the sixth with his RBI double. Moving the Needle: Ryan Raburn’s grand slam opens up a huge Detroit lead, +.327 WPA. The Sox looked to recover on Sunday after having their five-game win streak snapped on Thursday. They took a 2-0 lead in the first, but the Tigers put together a six-run fourth. 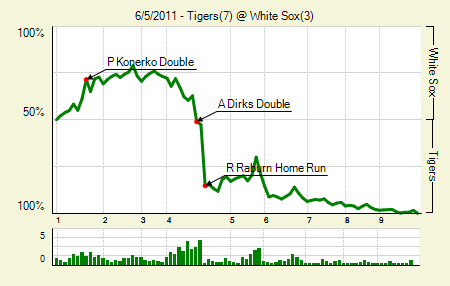 The rally started with a single and a pair of walks, and ended when Raburn’s grand slam made it 6-2 Tigers. Miguel Cabrera: 1 for 3, 1 HR, 1 BB. That’s two homers in his last two games, and four in his last six. Alex Avila: 2 for 3, 1 2B, 1 BB. He has a pretty decent lead in wOBA among catchers (.373). Moving the Needle: Carlos Beltran gets things started with an RBI double, +.107 WPA. Reyes singles, Beltran drives him in. 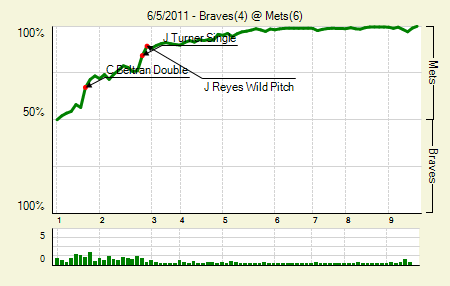 That’s a pretty effective formula, and it worked for the Mets’ first run on Sunday night. They scored four in the first two innings, and while they threatened to blow it toward the end, they did manage to hold on. Though that’s another finished game for Francisco Rodriguez, who is just 32 games finished away from having his $17.5 million 2012 option vest. Jose Reyes: 2 for 4, 1 2B, 1 BB. His SLG just crept over .500. Brian McCann: 2 for 4, 1 HR. He’s second to Avila among catchers in wOBA. 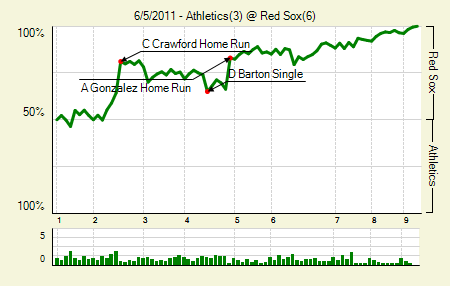 Moving the Needle: Mitch Moreland hits the first of two solo blasts, +.113 WPA. This felt more like a low-scoring affair than a pitchers’ duel. 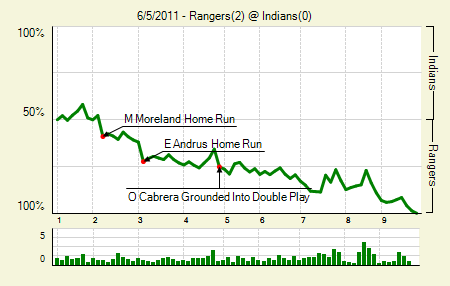 The game came down to just two solo home runs, obviously both by the Rangers. The first came off the bat of Moreland, and the second came from Elvis Andrus an inning later. 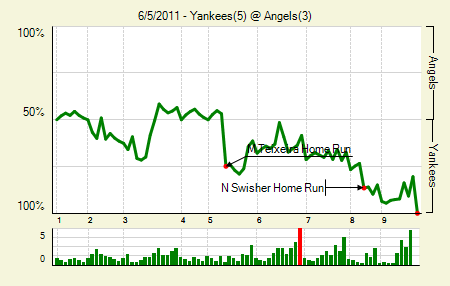 After that there was relatively little action, and the Rangers’ pitching won out. I was in Cleveland this weekend for a wedding, and yeah, spirits were not high. C.J. Wilson: 7.2 IP, 3 H, 0 R, 2 BB, 7 K. He probably could have gone longer, too. Moving the Needle: Neil Walker’s homer starts the Pirates’ sweep hopes, +.169 WPA. After taking the first two in the series, the Pirates jumped out to an early 2-0 lead when Neil Walker took Roy Halladay deep in the first inning. Of course, that just angered Halladay, who hunkered down and finished seven strong without allowing any more runs. The Phillies got their break when Chris Resop hit Carlos Ruiz with the bases loaded, bringing home the go-ahead run. Domonic Brown: 2 for 5, 1 2B. 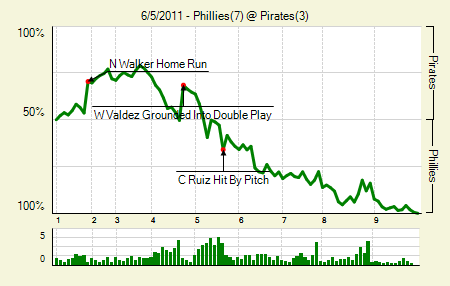 That was the only extra base hit of the game for the Phils. Ryan Howard: 2 for 4, 1 BB. He drove in three, including one on a sac fly. Moving the Needle: Jason Repko’s bases-loaded single brings home a pair, +.146 WPA. The Twins put two of their best hitters on the DL, further weakening the worst offensive team in the league. So what happens? They score 26 in a four-game series and sweep the Royals. The finale was simply a blowout, with the Twins taking a 3-0 lead in the first and cruising the rest of the way. The Royals managed just eight base runners all game. Alexi Casilla: 2 for 3, 1 2B, 1 BB. He went 9 for 19 in the series with a pair of doubles and four walks. Brian Duensing: 8 IP, 6 H, 0 R, 1 BB, 4 K, 10 GB. He actually allowed more fly balls (11) than ground balls, which just isn’t his style. But against the Royals, it worked. Moving the Needle: Greg Halman‘s triple breaks the tie in the seventh, +.342 WPA. You normally won’t see the Mariners in many high-scoring affairs, which made this one that much more special. Halman’s triple broke a 3-3 tie in the seventh, though that wasn’t close to the end of the game. The Rays came back to score three in the eighth to take the lead, and then the Mariners scored four in the bottom half to reclaim it. 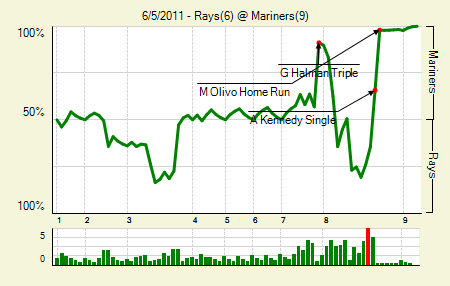 Strangely, Miguel Olivo’s three-run homer, which broke the 6-6 tie, did not move the needle further than Halman’s. I would think that a three-run lead in the eighth would be more valuable than a two-run lead in the seventh. Ichiro: 2 for 5, 1 3B. He drove in two. Carlos Peguero: 1 for 2, 1 HBP. He scored a pair, and it seems that he’s in the middle of everything. Moving the Needle: Jason Bartlett triples home the first run, +.163 WPA. The Padres opened their half of the game with a three-run effort, which Bartlett started with an RBI triple following a leadoff single. The Astros made noise here and there, but the Padres pretty much dominated this game. Chase Headley: 2 for 4, 2 2B, 1 BB. His walk rate is through the roof right now (14.1%). Brett Wallace: 2 for 3, 1 2B. If only he had some power he’d be an incredibly effective first baseman. 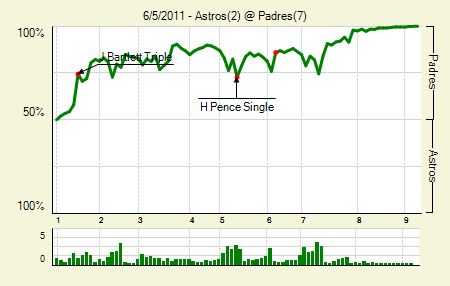 Moving the Needle: Freddy Sanchez ties the score at one, +.190 WPA. Again, not understanding WPA on this one. Yes, Sanchez’s single was big. It put the Giants on the board for the first time in the sixth, tying the game. You can’t go ahead if you don’t tie, etc. etc. But Andres Torres, who scored the tying run, drove in the go-ahead run in the eighth. Yet that wasn’t nearly as needle-moving as Sanchez’s. 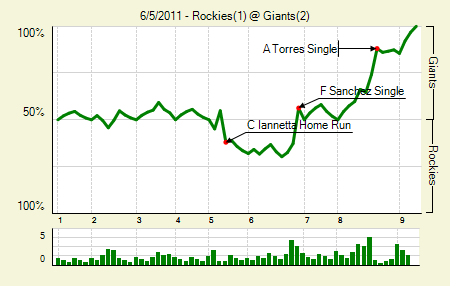 In any case, those are the two hits that overcame Chris Iannetta’s solo homer, which was the Rockies only run. Ryan Vogelsong: 8 IP, 4 H, 1 R, 1 BB, 7 K. Dave Righetti, have a hot dog with me. Jason Hammel: 7 IP, 2 H, 1 R, 2 BB, 4 K. He was at just over 80 pitches when they pinch hit for him in the eighth. I’m always eh on those moves unless there’s a real run-scoring opportunity. We hoped you liked reading The Morning After: Game Recaps for June 5th by Joe Pawlikowski! Are the Pirates Making a Mistake with Cole? The discussion today is in regards to whether Pujols was “auditioning/marketing” for the Cubs (FA at end of season). I say this is in retaliation for “The Sandberg Game”. Didn’t Quade say that they would rethink the situation of pitching to AP5 when they had a base open? I do think that CHC is the only team that can “afford” to give AP 300M. Is Cleveland still the WINdians? That’s what separates Halladay from the pack.